Korres Skincare & Makeup feature over 400 natural and/or certified organic products. I personally own a few and wanted to share my thoughts with you. My most recent purchase was the Korres 3 Step Prep with Quercetin & Oak. This set consists of a face primer, eye primer, and under eye concealer. Both primers have a cream like consistency and go on smoothly and easily. You can slightly smell the botanicals, especially in the face primer. The under eye concealer is now one of my faves (thanks to my genetics, I'm always searching for the latest & greatest in concealers). It can be applied with a concealer brush or your finger (I like to start with a brush and finish with my finger). I love the coverage, goes on smoothly, can be layered if needed. I also dab a little on the sides of my nose as well as any blemishes I may have going on at the time. The best part of these three products is that they are all anti-aging! Other Korres products I own & use regularly are the Mineral Foundation with SPF 30 and the Mineral Illuminating Powder. The Foundation comes in powder form and includes a sponge applicator (I like to dab it on with the sponge and finish with a brush). This foundation is perfect if you're looking for medium to light coverage, can be layered if needed, and does not feel caked-on or heavy. The Illuminating Powder is perfect to highlight the cheek bones as well as nose-bridge, and temporal areas, I especially like this product for an evening out. If you're looking for a perfect pink lip that you can wear day & night, try the Cherry Lip Gloss. 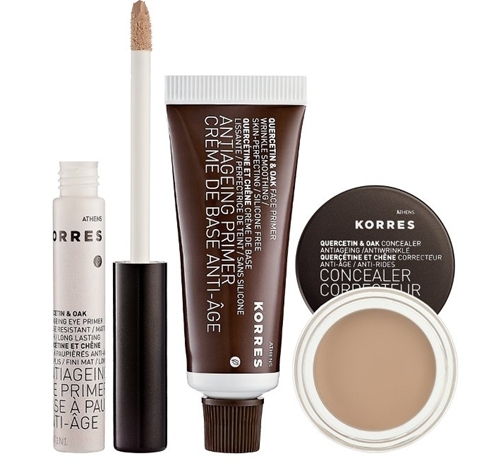 You can find Korres at your local Sephora, as well as on the web at Beauty.com, or their very own site Korres.com. Just got back from my trip to Boston where I spent some time and money on Newbury Street ! What a unique shopping experience. Located in the Back Bay area of Boston, Newbury Street is lined with the most charming row homes. These townhouses/brownstones, one more beautiful than the next, have been renovated with stores on one or more levels. You can find anything from affordable to high end, independent boutiques to popular chain stores, and everything in between. After all that shopping you will definitely want to put your feet up and have a bite, right? Well no worries cause they've got you covered. There's tons of cafe's and restaurants, including a very charming bookstore cafe called Trident where you can have a meal or just hang with a great book and a cup of coffee. Just thinking about the breakfast menu is making me hungry! There's usually a wait but worth every minute. Another great place to eat is Sonsie, the ambiance is relaxing, the staff is friendly, and the food DELICIOUS, probably, no ABSOLUTELY the best Cuban Sandwich I've ever had! There's a lounge area with a comfy leather couch & chairs, and they've recently added a Wine Room. You can spend hours walking up & down, going in & out of every store and you will want to come back for more. Aside from shopping & eating you can also find Specialty Shops, Salons & Day Spa's, Pet Shops & Pet Services, Electronics, Perfumes, Chocolates, Luggage, Art Galleries, I mean I can go on and on.......Oh almost forgot there's several Parking Garages, which is great because this is a tourist & local destination so it can get quite busy especially around the Holidays. Don't know about you but I'm a city girl at heart and for the most part I typically don't like shopping malls so this type of shopping is more my style. Even if you're not shopping Newbury Street is a sight to see, In my opinion one of the prettiest streets I've been to so far. If you're planning on visiting Boston please stop by you won't be disappointed. I can't wait to go back!! !